ARM Holdings has released details of its upcoming ARMv8 architecture at the ARM TechCon conference in Santa Clara, marking the chip maker's first ARM architecture to utilize a 64-bit instruction set. The new architecture builds on the success of the 32-bit ARMv7 versions, using the foundations put in place by the runaway success of the Cortex-A9 and Cortex-A15 chips by adding 64-bit processing and extended virtual addressing. The new 64-bit chips include two main execution states, AArch64 and AArch32. The A64 is for true 64-bit processing, and the existing A32 is part of the current ARMv7 architecture, including key features such as TrustZone Virtualization and NEON advanced SIMB which are to be maintained or improved as part of the release of the ARMv8 chips. “With our increasingly connected world, the market for 32-bit processing continues to expand and evolve creating new opportunities for 32-bit ARMv7 based processors in embedded, real-time and open application platforms. We believe the ARMv8 architecture is ideally suited to enable the ARM partnership to continue to grow in 32-bit application spaces and bring diverse, innovative and energy-efficient solutions to 64-bit processing markets,” said Mike Muller, CTO at ARM. The Cambridge-based chip producer started work on the new 64-bit range in 2007, removing the last practical barrier required to try to gain a share of the desktop and server markets that make AMD and Intel an absolute fortune. It also opens up possibilities for 64-bit tablets and other portable devices to utilise more than 4GB of RAM. The company is said to be aiming it at everything from sensors to high-end servers. "ARM is an important partner for Microsoft. 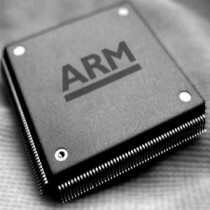 The evolution of ARM to support a 64-bit architecture is a significant development for ARM and for the ARM ecosystem. We look forward to witnessing this technology's potential to enhance future ARM-based solutions," said KD Hallman, a general manager for Microsoft. ARM's 32-bit chips have dominated the smartphone and tablets market, but the company's plans to enter the PC and server marketplace is likely to be much more complex. The new architecture could possibly compete with AMD and Intel in respect to better performance vs. power consumption but it is very unlikely they will match up to the raw performance of Intel's market leading processors -- at least not initially. ARM recently reported record third-quarter profits driven by huge demand for their Cortex range of chips, despite lower demand reported across the industry.